Looking "where to sell my Auburn?" Ask the Chicago Car Club! Are you wondering "where to sell my Auburn ?" The Chicago Car Club is interested in classic cars of all makes and models, especially a Auburn. We make the process of selling your Auburn quick and painless. In just a matter of hours we will have your classic valued and, if you do so choose, turned into money in your pocket. All it takes is a phone call or electronic inquiry to get the ball rolling. Frank and Morris Eckhart established the Auburn Automobile Company in Auburn Indiana. They had grown up working in the family business, making horse drawn carriages. They became interested in the new “horseless carriages” and started making cars in the year 1900. Their first car was a chain-driven, single cylinder vehicle priced at $800. It did not sell well, because it lacked the features and power that other companies were offering at the time. They went on to produce a touring car in 1904, which went for $1000, but also did not sell well. They kept learning and designing and by 1912 were offering a 6 cylinder engine car. The company was not thriving though and was bought out in 1919 by a group of Chicago businessmen, which included Charles Wrigley. Their first new car was the Auburn Beauty Six, which offered a sleek, fender-less body. The cars got much praise, but the company was still not successful financially. During the great depression, the company was making 6 cars per day, but selling so few cars that hundreds sat unsold in warehouses. A young businessman, E.L. Cord, saved the company. Cord had the 600-700 unsold cars repainted in two-tone color schemes and had all the trim plated in Nickel. They were sold within months and the money helped the company offer new models. 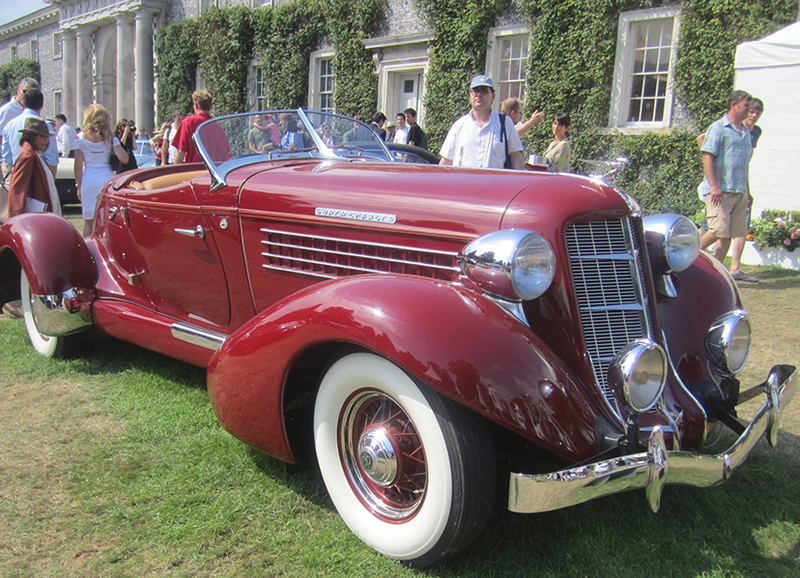 That same year, Cord partnered with Duesenberg, a maker of luxury autos. Many people call these cars Auburn-Cord-Duesenberg (ACD.) Under the Auburn name, the most famous of these cars was the 1935-37 Speedster, which was considered elegant and sporty for its time. The Auburn Boattail Speedster came with 4.6L 8 cylinder engine, with a supercharger option. It produced 150 hp and could go over 100 mph, which was very fast for its day. Auburn-Cord-Duesenberg (ACD) cars were favorites of the Hollywood movie stars of the time and are considered some of the most beautiful and luxurious cars ever made. They are becoming quite rare and are stars of auctions and car shows, like the Pebble Beach Concours d’Elegance.